Thanks for such a wonderful tool and for sharing it with the FM community, Claus! A great example of taking a complex process and simplifying it using FileMaker. Well done! Thank you for your tool for SSL! I don’t think I could have renewed without it, especially since I let the cert expire… So this is to say that even if the cert does expire, with your tool, and patience… you can renew the cert, so awesome! Is this a common problem and is there a way to solve it? The error message you get, is actually telling you the problem. It seems that the private key, that the server generates during the process, has been re-generated after you created the Certificate Request. I have heard the same issue experienced by a few others, but not seen it myself. However, if you do the process again, you should get a CSR, which uses the current Private key and then your signed certificate will be created with the same private key. So, please try the entire process again. You should be able to re-issue your certificate with your vendor, so you don’t need to pay again. Thanks for your interest in the tool. If you get a 404 error, it seems like the file is not uploaded correctly. It probably is due to permission issue. Please make sure to follow the guide and pay attention to the permissions part. My apologies for not being able to remember all details as I am very busy at the moment, but at some point before this, the tool should try to modify permissions on the httproot folder so we can upload the file. The 404 indicates that we were not able to upload the file. You are welcome. Hopefully the video and tool can help people with this very complicated process. – you need to have the private key file, that you created during the setup of your cloud instance. I can’t know for sure, but hope this helps. If you haven’t watched the video on youtube, please do so as we explain the process here. FileMaker Inc. has released a new version of FileMaker Cloud, that makes this process sooo much easier. I published an article, taking about this new version in regards of the improvement to SSL renewal. Hi and thanks so much for the tool…I’m puzzled by the “?” I am getting in the Certificate Request Field in panel 5 after running the Terminal command. I’ve tried to start from scratch a couple times and I’m not sure if that is problematic. The last time I tried, I added the extension .txt to my key pair, thinking it might make a difference. Either way, when I run the command, since already running it once and giving permission to the server to allow connection from my IP, I haven’t had to acknowledge permission again. Do I need to undo something, to truly restart the process? I sounds like you are missing the BaseElements plugin, which should be installed when you open the tool. Please ensure the plugin is installed and enabled. Sorry wasn’t sure if my note went through. Mine doesn’t show SHA-1, rather SHA256. However I went ahead anyway and copy/pasted both the MD5 and SHA256 number into the Filemaker database in your awesome step by step and after clicking “OK” at the “Now we are going to create…”, it pops open a new page in Safari with the URL ending in the .txt for the file that was supposed to be uploaded, but comes up with an error indicating it’s not there. It’s not clear, whether you are trying to renew the default certificate or if you are purchasing for your own domain. 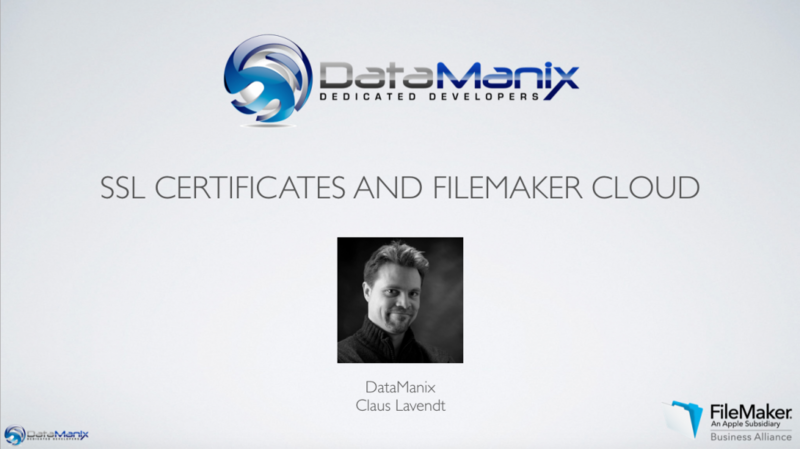 However, if you are renewing the default certificate, you should use the built-in process as FileMaker has essentially built the process from my tool, directly into FM Cloud. If you are using my tool for the process of purchasing and installing a certificate for your own domain, it is highly unlikely that you should use the steps, where we upload a text file to the server, which is used to verify that you have control over the server. When you purchase a domain validated certificate, the validation is normally done by sending an email to hostmaster@yourdomain.com with links to verify that you have access to this mail account. The reason for the step with uploading a verification file, is because you are purchasing a certificate for a subdomain, that is controlled by FMI. In that case, you will never be able to access a mail box for the hostmaster of that domain, since it belongs to FMI. So, you can use my tool to purchase and install a custom certificate for your own domain – though you should skip the steps with the verification file. If you need to renew the default certificate (so your instance would be named something like joshuabrock1.fmi.filemaker-cloud.com) you should use the process that you can access from the Cloud Admin Console. Is this process still necessary? I noticed the cloud console has a simple import feature much like FMS17. Isn’t it the same process now? However, if you want to use FMC with your own domain, you will need to go through a process, similar to the entire process in this tool. In other words, by omitting a couple of the steps in the tool, you can use it to create a Certificate Signing Request, so you can purchase a custom certificate for your domain name, and then you can use the install function in the Cloud Admin Console to import the signed certificate, you receive from your vendor. In FMS17, FileMaker “forgot” to include the step to generate the CSR file in the admin console. So you will need to use a CLI command to do this. The missing admin tool have a tool to help you generate this CLI command. After you receive your signed custom certificate, you can use the admin console to import the certificate.